You want to educate us, Penny? Like you educated us about Walmart? Like you educated the people on the Town Hall/Center School renovation committee? You know, like you insisted that we have windows that are not insulated at the town hall? It's too bad that you didn't allow anyone to educate you, so how are you going to educate us? It's always ok to say nice things about people and be anonymous, it's not so courageous to say mean things and hide behind a curtain. They tax our taxes, spend it, and then we owe another $4.3 million on what we bought with the tax on the tax. I don't need to be all that "educated" to know that buying something at a discount (or with a partial state match) is no good deal if it's going to keep costing me more money for something I didn't need in the first place. I believe at least some of the animosity stems from the fact that NOW the CPC wants to educate us. We've been on this program eleven years!!! I feel totally misled about all the projects we've undertaken. I always thought we were spending money that had already been collected, not borrowing decades worth of debt. Why was the CPC never publishing figures concerning available funds, debts incurred, etc? Yes, we, the voters, approved all those expenditures. But it truthfully never occurred to me that the money wasn't there. I'll watch the informational meeting, but my vote has already been decided. NO MORE BORROWING against CPA funds until that debt has been paid down. And let's hope that the CPC will make facts and figures regarding the funds a little more public in the years to come. The conservation agent is now asking to hire more help. Who is paying for all the work she's doing regarding the lands we bought with our double taxation and borrowing? Us. And not even with CPA funds, but with our regular taxes as well. We pay for this so called good deal with our regular property taxes along with our extra surcharge taxes and now we need to hire more help. The police have more areas to cover too, and I believe are looking to hire someone. How many ways is this wrong? What's going on in those woods is costing us dearly. "The best things in life are free." Yeah. Right. It is a great idea to educate the citizens of Sturbridge about the contents of the Community Preservation Act. There is a ton of misinformation being published in local newspapers. This seems like a terrific opportunity to explain in detail exactly what the CPA is and what effect it has on the Town of Sturbridge and it's financing of public projects. Why not look to the future? I am a relative newcomer here in Sturbridge, about 5 years, so I am not privy to all the old events and animosities. I'd like to concentrate on the future. I cannot see why we would want to cut off the possibility of future state matching funds for any project that Town Meeting might decide to do in the future. As Tom Creamer pointed out, if there is a project that is proposed that you do not like, go to the Town Meeting and vote against it. Would you cut off your health insurance because you were pretty sure you weren't going to get sick and you would not get into an accident? If you don't do that and the project gets accepted, then there will be no state matching funds and the tax burden for that new project will be paid for by the local property taxes. If you can't gather your friends to go to Town Meeting to oppose projects you don't like, then revoking the CPA does not stop those projects from happening. Revoking the CPA will just make your taxes higher than they would have been if we had not revoked the CPA. So put aside all the arguments you may have had before, and think about what we do now and in the future. Don't let old feuds cloud your judgment. Real wages have been going down for years. We, with our CPA, have been spending and borrowing for years, mostly for things we do not need. Wages are down. Spending is up. Some tell us to keep the CPA, to take another chance that the people will vote down the umty-ump requests that keep coming and coming and coming. We all know that some requests will be there over and over again, until at some stacked meeting another unneeded expenditure passes. I think that taking the CPA off the table will make people think a little harder about spending money that we do not have. We all know that some requests will be there over and over again, until at some stacked meeting another unneeded expenditure passes. That is a good point. With such a small percentage of people taking part in the town meetings it does not take that much to stack a vote. It would have been more difficult if two more people would have voted in favor of the Saturday meeting. I voted for some of the purchases we made in the past. I have mixed feelings about it now. I am glad the land will likely be kept as open space, i say likely because it sure seemed like some of it was going to be turned into some sort of recreation fields that would have cost the tax payers millions of dollars. I am not too happy about the taxes that i pay. I feel violated at the rate of our taxes. This is a great town to live in, but there are many other towns that are nice as well. It is sad that i have thought about moving elsewhere because of the taxes. If the CPA is revoked and the people do not vote down the umty-ump requests that keep coming and coming and coming, then what will happen? People seem to have some dream of what will happen when the CPA is revoked, but I have not heard a good reason to expect that this dream will come true. Could someone explain to me how revoking the CPA will prevent these projects from passing at Town Meeting if nothing is done to change what happens at Town Meeting? I am not denying the issue of the false recovery. If anything I am a stronger proponent that the recovery is false, than a Tea Partier would be. What I cannot see is how the actions that are being proposed to revoke the CPA logically follow from the observation that real wages for the 99% are not rising. At the primary on Tuesday, I heard someone say that they were so disgusted with Sturbridge that they would move if they could sell their house. I can just imagine that person telling a prospective buyer how disgusted they were with Sturbridge. I don't know if the seller would expect such statements to encourage the buyer to clinch the deal. If I were in the mood to sell my house and move out of town, I would brag about all the amenities in town to any prospective buyer. I would expect that these amenities are what would make my house worth more than a house in a run-down community that was depressing to look at. In fact, when I bought this house around 2005, I did reject living in some towns around here because the day-to-day environment around the candidate house was just too depressing to contemplate living there. Every time I visit or drive through those towns, I thank my lucky stars for having made the decision to choose Sturbridge instead. ssg13565, the way I see it, is that "we" never would have agreed to buy the OSV land, and would not have agreed to most of the other CPA expenditures if we hadn't thought that these things would quite easily be done with those magical CPA funds. Surprise! We OWE $4.3 million dollars! We actually now owe more in debt payments than we are locally bringing in. We must continue to pay our debt until 2030. Do I want to pay for even more projects with this extra tax (or sur tax) on our taxes? No way! Is the "we" never would have agreed thing something you would want to bank on? Or might that money have been spent anyway and our taxes would have been higher for it? What is the risk we are taking by cutting off an alternative source of funds? Imagine 862 acres of new houses had we not bought the OSV land. Perhaps 1700 new children or more for our schools. More streets for the police to patrol and fire department to protect. More streets to plow and maintain. It's a good thing that the town has been setting aside some CPA money to help pay the debt now that the the lousy economy is keeping the receipts below the level of expenses. I know that carrying a debt load of $660 per household can be a strain on some people's budgets. That is why the first $100,000 of your home value is exempt from the surtax. Also paying for that $660 dollar debt is spread over 20 years ($33 per year). What it comes down to, for me, is priorities; also, there has been a considerable lack of information provided to voters over the years, and I am also concerned that that the laws of the CPA have not been followed as they should be. People question why this is an issue for me at this point, and many have expressed how disappointed they are in me. Last year, when the Conservation Commission attempted to convert the Shepard parcel to multimillion recreational fields on top of rare turtle habitat, it prompted me to conduct deeper research of the CPA. If people feel there is something wrong with sharing that knowledge, or putting a question on ballot so voters can decide what they want, that is unfortunate. At least now, people know where to find and access information and can wade through it, separate the facts from the rhetoric, and make a personal choice about whether to keep or revoke the CPA. The CPA is a great tool for buying things like forested hillsides, wetlands resources, historic documents and buildings, and also for creating affordable housing opportunities. These are certainly an important part of the community menu. But in our economy, shouldn't we be making funding decisions that will bring money in rather than take money out of the town and its residents? The argument from CPA proponents is that regardless of whether CPA is retained or not, such projects will come forward. That could be true, but since only those types of projects can be funded with CPA, is it prudent to even consider such projects until our local economy is patched and repaired? Shouldn't we be prioritizing what we're willing to go into debt for? For example, CPA cannot be used to fund a waterline down Route 15; it will not fund an Economic Development Director; it will not fund additional Department of Public Works employees or other town staff; it will not fund management plans for the town's buildings, or studies to figure out the long term capital needs of the town; it will not fund upgrades or expansions to the Public Safety Building or the DPW Garage/Maintenance Facility, which is an immediate need; it will not fund repairs to three bridges that fall under local jurisdiction on Holland, Champeaux and Farquhar Roads, which are also immediate needs. Read the Master Plan - this list goes on and on. What CPA does fund is open space acquisitions for conservation and/or recreation; historic preservation projects; and affordable housing projects - all good stuff in good economic times. But where is the return and/or revenue from these purchases in our current economy? The bottom line is, CPA advocates want to continue the CPA so they can continue to buy and fund those things that require long-term borrowing. According to the Master Plan, we can expect projects that involve expensive recreational fields, more trails, and more open space acquisitions, all which will also require more staff to care for and maintain, which can't be paid for with CPA funds. I am and continue to be an advocate for conservation; however, unlike many of the conservation advocates who support building fields on top of rare turtle habitat, I also believe in balancing the community menu by sorting out the WANTS from the NEEDS. Resorting to statements that citizens will have to choose between projects that are a WANT versus a NEED won't make sense to voters unless there's a direct return in revenue, or unless town meeting is stacked with proponents, as another poster mentioned previously. If given the choice between funding a waterline down Route 15, an Economic Development Director, and fixing bridges - or purchasing open space, building recreation fields, or doing another town hall renovation project, I'm choosing the former because there's a return. ssg13565, it sounds like you and Penny are both concerned with too many people coming into town. I don't feel it's right to attempt to buy up land to prevent tax paying people from coming in and paying taxes as their share of our costs to live here. If you feel you have the right to try to control this sort of thing, I cannot do anything about that. Thank you both for at least admitting your thinking on the matter. I could not and will not agree with your way of thinking. I am very willing to let others into the neighborhood. ssg13565, thanks for letting us know that, if you are correct and it's not even more, the average total cost per household for the OSV parcel of land alone will be $660. Does that include our "fabulously low" interest rate, too? 'Just goes to show ya how our "bargain basement prices" on things we don't need can quickly can quickly add up. "What is the risk we are taking by cutting off an alternative source of funds?" I don't look at it as a risk, but as a light shining on a problem. We have set ourselves up to getting around Proposition 2 1/2 until the year 2030. Before we had the CPA, it used to be spelled out clearly each year we attempted to cross the 2 1/2 line. I think we should scrap the program, pay the debt, as we have no choice in the matter now, anyway, and think long and hard about the "opportunities", such as the CPA which come along like little gems, promising that we can have our cake and eat it too. It doesn't work. It always costs more than anticipated. If there is an opening at a poorly attended town meeting, and the CPA program is still functioning, another purchase will surely be made. Greed has taken over. The may be OUR town, but it is not and should be not so exclusive that we prevent people from living here either by price or by buying up the land to keep them away. 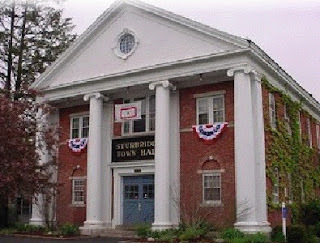 We are looking at a possible 4.8 percent increase in our taxes this year in Sturbridge. That increase in the dollar amount of our tax payment will then increase the dollar amount of the $3 surcharge for the CPA. Please don't tell me, "Yes, but by just a little." That's how we got into this pickle. Lots of little things have quietly added up to a large amount. We are told that the CPA debt is $4.3 million, ONLY almost 9 percent of our total $50 million dollars of debt. ONLY? What are they thinking? If our household dept is more than we, in our home, are taking in on our own, and we have to use our life savings to pay the piper, we are in deep doo-doo, no? He shops the CPA as a “buy two get one free sale” – there is nothing “free” about the CPA. The article leads people to believe that the Commonwealth of MA is practically giving the state matching funds to us and we should be very thankful for it. In fact, the “state’s match” should be called the “people’s match” because that money comes from extra fees charged on real estate transactions at the Registries of Deeds – people who buy, sell, refinance, discharge a mortgage, or record a municipal lien. Those fees are then collected by the Department of Revenue (DOR) and placed into the Community Preservation Trust Fund, which is administered by the DOR. After WE pay the DOR 5% for that administration, the “people’s match” is distributed to cities and towns that have adopted the CPA; that’s the “match” to the 3% surcharge we all pay on our property tax bills. The “match” is NOT a grant and it is certainly not FREE. It is completely funded by taxpayers and in fact, we get nothing from the state except a check. Revoking the CPA has nothing to do with the amount of matching funds we currently receive. Whatever is collected from the increased fees at the Registries of Deeds and is normally distributed,the town will receive it just as it has since 2001. The statement that revoking the CPA will “eventually lead to the elimination/reduction of some town services in order to fund future projects, projects that could have otherwise been aided with the CPA funds,” is upside down isn't it? For example, suppose the CPA is revoked and voters at Town Meeting approve funding $2,000,000 for new recreational fields – that would require long-term borrowing under the CPA, and the only difference is the “matching funds” which we know have been steadily declining since 2008. At the town’s budget meetings a couple Saturdays ago, the Conservation Commission requested additional staff to help with managing the open spaces we have right now; if they need help now, what happens when expensive recreational fields are built? The town will actually need more Public Works, Conservation Commission, and Rec Department staff and it says so right in the Master Plan. The 3% surcharge we have right now was accepted by voters in 2001. If the CPA is revoked and then brought back after our debt is paid down, voters could adopt a 1% or 2% surcharge, plus institute the Low Income or Low/Moderate Income Senior Housing exemption, so that people who can’t afford this can opt out of it. It is troublesome to me that this particular exemption was not instituted in 2001, and I question whether voters were aware of it, or even given that option. If re-adopted at 1% or 2%, that would definitely mean less money coming into the town; but personally, I’d rather have less money to spend than to think about people who are currently losing their homes (there are currently 30 foreclosures in Sturbridge) and struggling to buy food. -The CPA has no effect on the town’s bond rating. If it did, I imagine our town administrator would have mentioned that in his report to Selectmen in February 2012; in fact, the town’s bond rating is the same last year. What changed was the “Outlook” for the town, which increased from “stable” to “positive.” It’s not a significant change, nor was it affected by the current movement to revoke the CPA. If anyone finds mention at Moody’s or Standard & Poor’s Rating Services that a town’s revocation of the CPA is “devastating” to a town’s bond rating, please let me know. -the alleged “guaranteed 75% matching funds” touted on the green flyer is false. If one reads the text of the proposed CPA legislation, they propose INCREASING the extra fees currently charged at the Registries of Deeds and are shooting for a minimum 75% match; but if that’s not attainable, the match “shall be less than 75%.” Here is the text of the legislation, see lines 131 to 148: http://www.malegislature.gov/Bills/187/House/H00765. Kathy Neal, Esq. has read it and she says it is not guaranteed. Revoking the CPA will not stop extraneous projects from coming forward at Town Meeting. However, without the CPA to fall back on, raising the pink card to buy such things at Town Meetings will force people to make choices in terms of WANTS versus NEEDS. As one has poster mentioned, being upside down currently on the local CPA surcharge income versus our annual debt for these projects should send a very strong message to Sturbridge residents about the management of the CPA and how spending is out of control. If you want to control spending, come to the Town Meetings and Town Elections, and make wise choices about how to rebuild Sturbridge. To me the revocation on the CPA is more of a stand against spending in general. Sure the CPA has been great in the past and is a good card to have in our pocket for the future. I will be voting in favor of revocation simply to let my vote be heard that i am against the spending of the past and spending for the future. It has gotten way out of hand and without the CPA people may be less apt to approve spending if we have to flip the whole bill for it. How bout this idea. It works on a household level... When something needs to be purchased i save to avoid having to borrow for it. Living life with minimal personal "debt service" is something we all strive for, why not on a local level as well? Anonymous who wrote, "Spending got way out of hand." is right. I can't believe that we spent all this money on land to let the volunteers develop trails. What happens when these volunteers, who are so in love with the projects go away? Will the woodlands that we spent so much money for just grow up all over again, or will we feel that we have to hire people to continue working on this never ending trails project, which has been suggested will eventually reach (within 2 blocks or so) of every home in town. It has even been suggested that we have trails going to the schools! I don't even want to think of the tragedies that could come from that venture. Why is the town allowing and even publicizing contests out in the woods during hunting season? I mean, how can they tell people to dress their children in bright colors and go on a hunt for decorated trees when the hunters are out in those woods? This stuff needs to stop for so many reasons. To me, revocation of the CPA is indeed a stand against spending in general; and hopefully, this issue underscores the importance of participating in Town Meetings where all the spending and borrowing decisions are made. This is YOUR money that's being spent by a small percentage of voters in Sturbridge. Some new news: the town administrator's forecast for the FY2013 tax rate is an increase from $17.63 to $19.13. That's an increase of $1.50/$1,000 of the assessed property value, and it's on par with the last two year's increases. Also, Barbara Barry, the town's Finance Director, has confirmed some additional information with the Department of Revenue: if the CPA is revoked, all new OPEN SPACE and HISTORIC projects must cease until the $4.3 million in debt is paid down (because all the CPA debt consists only of Open Space & Historic projects.) Therefore, all the surcharge revenues and any matching funds collected must go to pay down the debt. However, there will be approximately $375,000 in the Affordable Housing Fund that can be used for those purposes (see Chapter 10, Page 10-6 of the Master Plan for ways to use that money) and spending cannot exceed that existing balance. Some more news: the Department of Revenue has forecast that the first round of matching funds, which was 26% this year, will be reduced to 22% next year. However, this is subject to change and the percentage could be higher or lower than 22%. Lastly, if voters are inclined to revoke the CPA, please commit to attending Town Meetings so that when borrowing and spending decisions need to be made, YOU have direct participation in those decisions. YOU will decide whether to borrow or spend on projects that rebuild the local economy; YOU will decide whether town employees get raises and staffing at town hall is increased or not; YOU will decide to spend money on Open Space projects that do not bring revenue into the community. A higher tax rate will also mean the 3 percent surcharge for the CPA will increase dollar-wise. Three percent of more money equals even more money. I sure hope folks understand the math! Our children and elders are being priced right out of town. And, don't forget, folks, when your taxes go up, the dollar amount of your 3% surcharge will increase, too. Cut up the credit card, because we owe much too much already. I sure wish my family wasn't stuck with the $660 we have to pay over time for the OSV land purchase alone! awareness about other aspects of spending. letter, as a courtesy and out of respect for the two of you, whom I believe to be honorable and just individuals. To that end, no reply is warranted, nor desired specific to this particular correspondence. Thank you both for your commitment to our community. Thomas R. Creamer, Chairman - Board of Selectman"
Thanks, but no thank you, Mr. Creamer. What I see in your invitation is that you have removed the opportunity for me to speak with you about this issue; yet you retain your right to be able to speak with everyone else, but you won't speak with me. That is unfortunate. 1) The CPA is an act of the legislature – it’s supposed to be a good thing and voters are supposed to have the flexibility of revoking it after five years. Built within it are flexibilities for residents to have choices about ways to spend that surcharge money. If revoking the CPA is going to be “devastating” to the town and its residents, can Selectmen please explain why voters were given the option of adopting it in the first place, especially in light of the fact that it’s revocable? 2) If revoking the CPA after going $4.3 million into debt on CPA projects, as Sturbridge has, is so damaging, isn’t this information that voters should have had before voting to borrow and go into debt? 3) The whole idea behind revoking the CPA is to give voters the choice to control spending on projects that do not produce a financial return to the community, pay down that debt, and possibly bring the CPA back at a later date when residents are in a more comfortable spending position. With town officials seeking to find ways to cut spending and save money, why is revoking the CPA a bad thing? Residents may recall the 2011 Special Town Meeting when the controversial warrant article, Article 48, asked voters if they wished to insert “active recreation” into a seven year old deed to the Shepard parcel. The Shepard parcel had been purchased by voters in 2004 for conservation purposes – at least, that’s how it was presented to voters at Town Meeting in 2004 – then, 7 years later, in 2011, town officials decided that, well, town officials had really intended to include active recreation as one of the uses of that property, so let’s ask the voters again to see if this is what the really wanted. Even more disconcerting is the fact that the Conservation Commission, which is responsible for management of the property, pushed this agenda beyond their own obligations under the Conservation Commission Act of Massachusetts. Members of other Conservation Commissions I spoke with across the state were shocked at how the Conservation Commission was promoting the conversion of the Shepard parcel. Such hogwash – the reality behind Article 48 was that I and another resident spent six solid months writing letters, e-mails, and providing copies of minutes and other documentation to Selectmen and Finance Committee that showed the property was never intended to be active recreation. That documentation included Selectmen’s 2004 Executive Session Meeting Minutes, which plainly stated recreational fields were NOT intended, plus they were provided meeting minutes, agendas, and news articles, all that supported only conservation uses. And yet, in the end, both the Selectmen and Finance Committee decided that people had the right to vote on that issue, so they brought the question forward to Town Meeting and it failed by only 10 votes. In this case, the process worked as it should have – even though that Town Meeting was “stacked” with proponents in favor of converting that conservation land to multi-million dollar recreational fields, and the plan was to use the CPA is pay for it. This is not about being anti-recreation fields or pro-recreation fields; this is about controlling spending and the current lack of choices and control over the spending. On April 9th, citizens will have the opportunity to decide if they wish to revoke the CPA. But it’s not because Selectmen decided to give people the option of deciding it as they did with the Shepard parcel. Rather, citizens had to invoke their right to petition for this ballot question and it garnered a total of 365 signatures, of which 346 were certified. That’s a significant amount of signatures – it’s a larger amount of citizen representation than might typically be seen at Town Meetings in any given year. Yet, not one Selectmen signed that petition; not one Selectmen feels citizens should be able to decide this issue and the amount of propaganda coming from that board, as well as the Community Preservation Committee, Open Space and Trails Committees is simply astounding. Why? Because they don’t want the borrowing mechanism cut off. Vote YES on Ballot Question #4.